RSA refers to the dynamic part of heart rate variations which is associated with the coupling/interplay between respiration/breathing and Autonomic Nervous System (ANS) dynamic, oscillatory behaviors, which we observe qualitatively and quantitatively in the analysis of RSA-pattern, information which can be effectively used in clinical settings/work. RSA can be used for biofeedback as it is cardiac behaviors in real time measured as inter beat interval with ECG-measurement systems (see below). RSA-biofeedback can be used as intervention tool (independent variable) in clinical work and ideographic and nomothetical research as well. Heart Rate Variability (HRV) usually refers the spectral analysis of ECG time series of all variations. HRV can be used as outcome measure in assessment at different degrees. Heart rate can be derived from electrocardiogram (ECG) waveforms and pulse rate from photoplethysmogram (PPG) waveforms. Most reliable is ECG, which measures the electrical activity of the heart by using electrodes placed on the skin. A heart rate is identified as an inter beat interval (IBI), that is, the interval between two R-spikes (see below) identified by a Schmitt trigger. Pulse rate can also be measured with photoplethysmogram which identify pulse rate identified from blood volume pulse. At least for clinical use we need to use ECG for measuring heart rate, especially in patients autoimmune and/or cardiovascular dysfunctions! There is a way to visually examine the measurement of photoplethysmographic Blood Volume Pulse (BVP) and thereby estimate the accuracy of using PPG BVP as reliable measure of pulse rate. “Our results demonstrate that even though PPG provides accurate interpulse intervals to measure heart rate variability under ideal conditions, it is less reliable due to its vulnerability to motion artifacts. Therefore, it is unlikely to prove a practical alternative to the ECG in ambulatory recordings or recordings made during other activities” (https://www.ncbi.nlm.nih.gov/pubmed/19728090). My conclusion so far is concerning most effective use of biofeedback and different modality is: Those who work in the way I do use RSA-biofeedback during the initial phase (by a number of reasons, not detailed discussed here) and then ”move to” FT-biofeedback (finger temperature) for other, practical reasons, including: It is easy to understand and use by the patients’ home training and can be used later on in real world without any measurement equipment! In the figure above some of the ideas of some unifying forces within and between individuals are represented. In e.g. Energy Medicine some initiatives are taken to try to find a kind if unifying conceptualization, where https://www.monroeinstitute.org/article/3580 is one. As a traditional scientist I am cautious about such thought but at the same time to not reject them completely while we do operate all of us upon limited knowledge. As RSA is a mirror of complex oscillatory interactions (see more below) I move “forward along” this concept where thousands of hours work on-line with patients (RSA, FT, etCO2, SpO2, ..) really add much thought to present knowledge I myself have extracted from existing (limited) knowledge in this field). So, this model is just presented as a (limited but) overview of some ideas around something we intuitively feel while not really understand! The blue is symbolizing different ideas about basics in physics, red refers to von Bertalanffy´s general Systems Theory (1968), yellow to different ideas about flow, resonance and coherence .. (where many other ideas can be added), orange refers to cambiata in music, a specific short key-phrase which can be regarded as a sinus curve, symbolizing the good and god, where the tritonus interval symbolize the opposite, and the grey the well known symbols in Asian medicine. 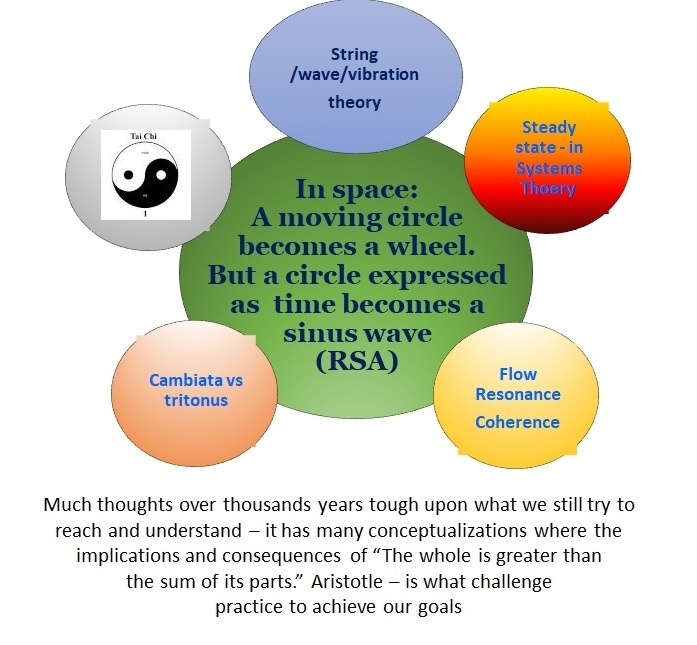 A wheeling circle expressed in one dimension can be conceptualized as a sinus wave – and RSA? RSA as the interface between ANS oscillation – two forces in a complex stand-by habituation condition critical for survival, a successful consequence of evolutionary forces – and the oscillatory behaviors of life – our breathing and respiration (for the difference see http://sci-culture.com/advancedpoll/GCSE/differencebetweenbreathingandrespiration.htm)? Oscillation is a solution almost everywhere, and its interactions within and between systems is poorly understood. This means we have to work with hypothesis and here RSA behaviors and patterns are a practical useful instrument, given used with carefulness and respect for variations between but also within individuals over situations and time. The great problem with oscillatory processes is how involved forces interact, including synergistical consequences which in itself can have profound effects over time on depending/compensating systems. In breathing change in pCO2 can get traumatic effects, e.g. hypocapne and its complex buffering systems (at different levels and also time – some substantial, and thereby very complex delayed responses! Now if we only focus on RSA (or HRV spectral analysis of heart rate (ECG detected!) time series but do not pay attention to the consequences on breathing behaviors (where each individual is unique also concerning dynamic etCO2 behaviors!) then we can do more harm than good – without even realize it. Even worse, if we (external) phase on individuals breathing behavior without etCo2 information, effects can be quite fast fatal! Many are phasing (with more or less) pushing forces individuals to achieve 6 breaths per minutes which is to challenge another individuals health, at worse life threatening!